Many older adults rely on their physicians to help maintain their lives at the highest functional levels. The mental and physical problems unique to each patient on the aging trajectory require astute diagnosis, innovative treatment, and extraordinary compassion. Meet four geriatricians, nominated by their colleagues for their outstanding dedication and care delivery, who embody excellence in geriatric practice. From early on, the science of aging fascinated Nancy J. Stiles. With her initial exposure to geriatrics as an elective during her residency, she embraced the interdisciplinary teamwork involved in caring for older patients. That attraction, coupled with her love of older people, launched her foray into geriatrics, where her patients’ sharing of their diverse histories and collective wisdom keeps her earnestly engaged. Connecting with her patients comes naturally, likely springing from her closeness with several older relatives, including her father, mother, and grandmother, who helped in forging bonds with elders. Stiles’ eagerness to listen and learn about the Great Depression, World War II, and myriad other life lessons contributed to her desire to enhance her own exposure to older adults as patients. Although treating older patients can prove challenging, Stiles concentrates on the many ways physicians and other professionals can improve patients’ lives. She particularly enjoys her association with the rehabilitation hospital, noting the strides that patients can make toward better health and function through proper diagnosis and comprehensive treatment of many conditions that can be improved, if not eliminated. One of her lectures related to complaints frequently registered among older patients is titled “Don’t Blame It on Aging.” Her lecture dispels the myth that many conditions develop as a normal part of the aging process. She notes that many symptoms manifested by older patients are related to treatable conditions. Sometimes taking a comprehensive approach in a rehabilitation plan can significantly improve patients’ quality of life. She finds the rehab aspect of geriatrics particularly appealing, deriving satisfaction from the positive feedback caregivers provide. Family members and caregivers often express gratitude for improvements in a spouse’s or parent’s status. The opportunity to work with the physician’s assistant program is a rewarding experience, she notes, especially when students develop an affinity for geriatrics. Of the 20 physician assistant students per year she mentors, a good number gravitate toward geriatrics and geriatric rehabilitation. 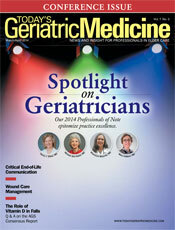 Over the past decade, Stiles has observed a continued diversification in the practice of geriatrics. In the years to come, she anticipates specialization into defined branches of geriatrics, such as long term care or palliative and hospice care. Likewise, she expects to see a move toward establishment of more Acute Care for Elders units to provide improved geriatric care. For Michele Ann Haber, her professional life took root in social work, where she identified geriatric clients and patients as her favorite population. Attracted to their colorful stories, rich history, and many experiences, she knew she would thrive in treating older patients. Fast-forward to 2014 where, as a physician, she recognizes the importance of listening and watching when interacting with patients. Before she speaks, she says she tries to discern her patients’ biggest concerns and assesses how she may be able to help. What she terms “active listening” forms the foundation for determining how to relate to patients and cultivate their trust so they can show her how she can help them. Admitting that there’s not always a fix for patients’ conditions or concerns, she notes that identifying the little things that may be helpful and thinking outside the box often contribute to improving patients’ comfort and function. Working with the “frailest of the frail,” Haber visits patients in their homes or facilities. Managing polypharmacy, arranging medication regimens, or showing patients some tricks and solutions that can improve their lifestyles and function help to make a difference in her patients’ lives. Although she engages primarily in consultations, she continues with some primary care. If a patient becomes acutely ill, whether at home or in a facility, she makes a visit. She maintains close communication, making herself available 24/7 to patients and their families via electronic devices. In addition to enjoying interaction with her patients and their caregivers, she finds exhilaration in the detective work required to treat patients with multiple chronic conditions complicated by numerous variables. Haber typifies the sandwich generation lifestyle through her close association with her own nearby parents and a teenage daughter. Her responsibilities as the daughter of aging parents help her identify with daughters of her patients. She enjoys teaching families how to deal with parents’ care and finds special motivation in seeking the good aspects of her patients, even among the most difficult and ornery. She laments that the fragmentation that often characterizes the practice of 21st-century medicine often exerts a negative impact on clinical practice. Concerned about the future of geriatrics practice, she finds that paperwork and billing requirements make it easy to lose sight of the patient. However, her personal methods, motivation, and management prevent that prospect. Years of practicing outpatient medicine led Ritamarie Moscola to seek a professional reinvention. She completed a geriatrics fellowship that launched her on a path toward serving a population she had found to be in danger of being ignored both emotionally and physically. Recognizing the elderly’s different outlook, needs, and priorities, she has discovered ways to connect with patients, promote cultural change in the nursing home, and even save some health care dollars. Instrumental in the development of a unit devoted to hospice and palliative care, she sought to tailor care to patients’ individual needs. Embracing the need to become proactive in managing end-of-life care, Moscola emphasizes the importance of physicians developing a proactive initiative to conduct end-of-life conversations with patients and their families. As the lead clinical ethicist on her facility’s ethics team, her weekly review of end-of-life issues, resource allocation, and patient care needs helps to maximize patient satisfaction and team efficiency. In 2012, Moscola completed the credential as a certified physician executive through the Certifying Commission in Medical Management, acknowledging her clinical expertise, leadership management experience, and communication skills. She expects the practice of geriatrics to acquire a different archetype over the next decade. Older adults’ intentions and determination to age in place will likely require higher levels of home care. And shorter hospital stays will continue to result in higher numbers of nursing home admissions of patients who are more acutely ill. It won’t be long, Moscola surmises, before nursing homes become subject to increasing scrutiny of statistics for patients’ rehospitalization following discharge from nursing homes. A series of positive experiences led to Mary Colburn embarking on a career trajectory that landed her in the field of geriatrics. A medical school background that emphasized a biological, psychological, and social approach to the practice of medicine initially sparked an interest in primary care. However, a course at Boston University’s Summer Institute in Geriatric Medicine exposed her to a cadre of caring clinicians whose case presentations included “wonderful stories” of their elderly patients. Credible teachers and outstanding role models influenced her during residency as well. Years later, she finds satisfaction in her solo practice, guiding, empowering, and supporting patients and their families, often on the journey of dying. She notes that 90% of her patients die in the community rather than in a hospital, as is their desire. As the medical director of a managed care program in the business of managing a publicly funded health care program for vulnerable older adults, she coordinates the activities of 100 case managers who care for 5,000 patients. Their goal is to keep patients in the community by initiating and coordinating various services, with a special focus on monitoring care transitions via a team approach. Much of her success stems from building relationships over the years with patients and their families. She notes that although hospice is an important program, hospice personnel often lack the opportunity to know their patients. Her advantage in managing her patients’ journey of dying lies in her knowledge of their personalities, their confidence in her, providing proactive care, and speaking with patients about advance directives. She listens carefully to what patients want and how they want to die. Although reimbursement issues continue to plague geriatricians in general, Colburn draws encouragement with Medicare’s recent acquiescence in adopting new codes that will enable reimbursement for monitoring transitions of care. She’s gratified that Medicare has acceded to offering a financial reward based on the acknowledgment of the high risk associated with health care transitions. Colburn’s practice is unusual for its inclusion of only Medicare patients, if not for one of her “staff members.” Jessie, her golden retriever, accompanies her to the office. Since she was four months old in 1997, Jessie has been an integral part of the practice. Colburn suggests her patients may visit her office as eager to see Jessie as to see her. Her four-legged assistant plays an important role with the patients. She even leads them to the exam room, to the patients’ delight. Colburn expresses concern about the prospects for future geriatric care, noting that a shortage of practitioners will likely lead to more prevalent use of nurse practitioners and physician assistants to deliver geriatric care. She’s hopeful medical students will focus less on the geriatric stereotype of sick and frail elders and identify the positive aspects of geriatric practice that will attract them to the field. — Barbara Worthington is the editor of Today’s Geriatric Medicine.